Three angelic voices, glorious harmonies, and a sophisticated collection of homespun winter-themed songs and holiday classics - the perfect accompaniment to a glowing fire and a mug of hot chocolate. glowing fire and a mug of hot chocolate. winter, touring their snowy-season side-project through community halls and concert series each December. 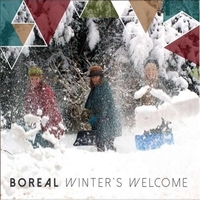 After 8 years of shows and much prodding from their fans, they’ve called themselves “Boreal” and released their debut CD, "Winter’s Welcome". showcase the soaring vocals of three of Canada’s finest harmony singers. James Gordon. She is also the co-founder of Guelph’s Hillside Festival. Expedition as it plies the seas of Antarctica and the Norwegian Arctic. of the holiday season -- and the beauty of the snow-covered landscape.